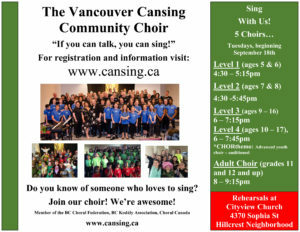 Registration is open for Vancouver CanSing’s 7th season! 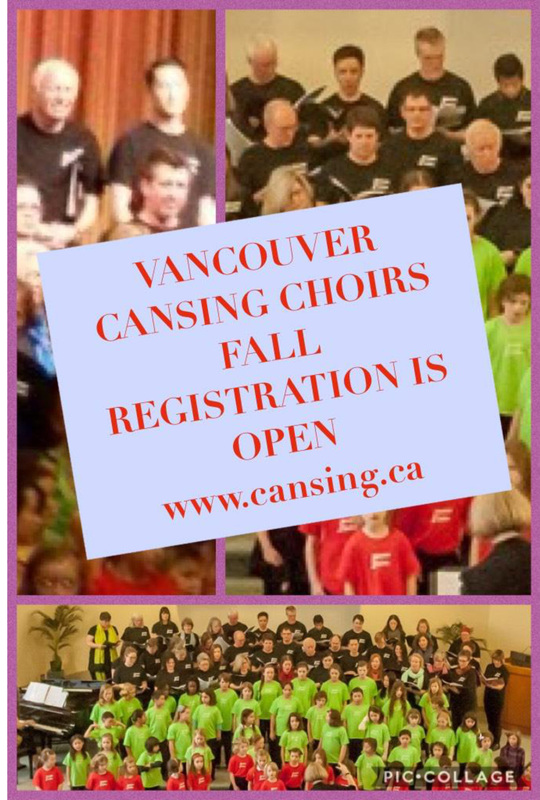 The Vancouver CanSing (VCS) 2016 fall session registration is open! All rehearsals begin Tuesday, September 20th, Cityview Church. 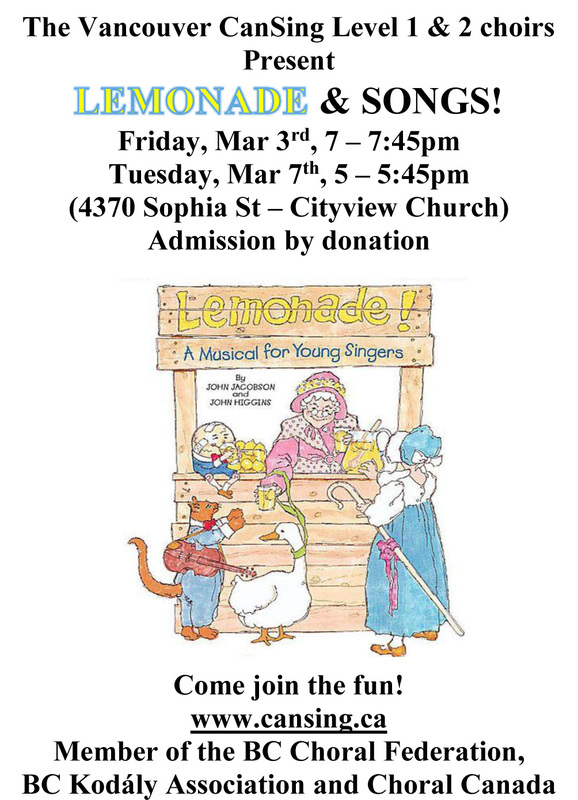 We welcome new members (youth and adult) who love to sing and perform. Please share via email, Facebook, Twitter, newsletters so the word gets out to people who are keen to sing! LEVEL 3 (Maximum 35 members – Non-auditioned, ages 9 – 15) 7 spaces (Sept 8th). LEVEL 4 CHORTHEMO (Maximum 20 members, auditioned – Boys/Girls ages 10 – 16 SAB). *New: boys are welcome to join this auditioned group. 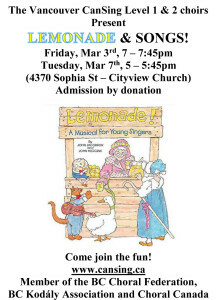 See information regarding auditions. 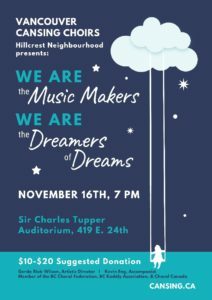 The choirs will be rehearsing for the 70 – minute show, I’VE GOT A DREAM, Friday, November 18th, 7pm and will feature thematic songs from the classic, jazz, popular, musical theatre and folk genre. 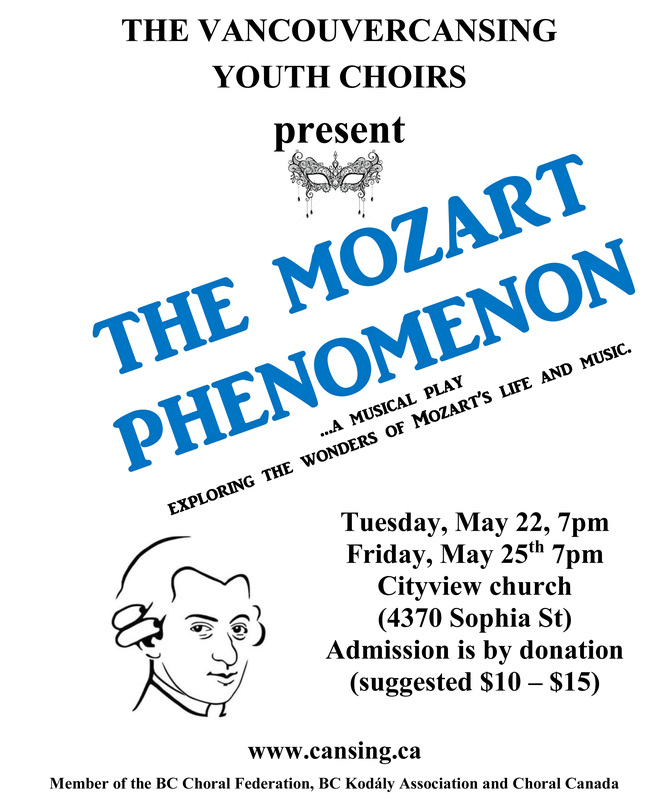 While many pieces are still being selected, the show will feature such choral repertoire as Mozart’s DIES IRAE, Faure’s Sanctus, Croce’s I GOT A NAME, Elfman’s NIGHTMARE BEFORE CHRISMAS medley and Webber’s ANY DREAM WILL DO (Mass Youth Choirs). Sung by the Adult choir two years ago, the VCS mass choir of 150 voice will perform the choral arrangement of Carly Simon’s hit song, LET THE RIVER RUN. A more detailed list of music repertoire will be sent to registrants at the end of June. VCS Level 1, ages 5 & 6 years (K, grade 1) and VCS Level 2 ages 7 & 8 (grades 2,3) are now full. Sometimes a few spaces come available before first rehearsal. Also, some spaces will open up for the January 2016 session. 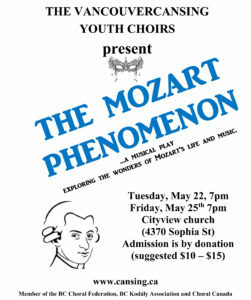 Rehearsals begin Tuesday September 22nd, 4:30 – 5:15, 4370 Sophia St, Vancouver. You will be notified about space availability prior to this. Member of the BC Choral Federation and BC Kodaly Association. 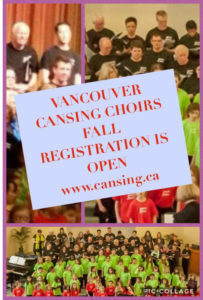 The Vancouver CanSing website is now open for fall 2015 registration! It’s going to be another great season! Thank you to those who sent music suggestions. If they’re not used in this concert, they’ve been added ti a list for future shows. The approximately 60 – minute show, DON’T LET THE LIGHT GO OUT, Saturday, November 21st will feature songs from the classic, jazz, popular, musical theatre and folk genre (I’ll be sending a sneak preview in the next week). Peter Yarrow’s Light one Candle (Peter, Paul and Mary – 25th Anniversary Concert via @YouTube)) will be the mass choir selection (all choirs will join together in singing). 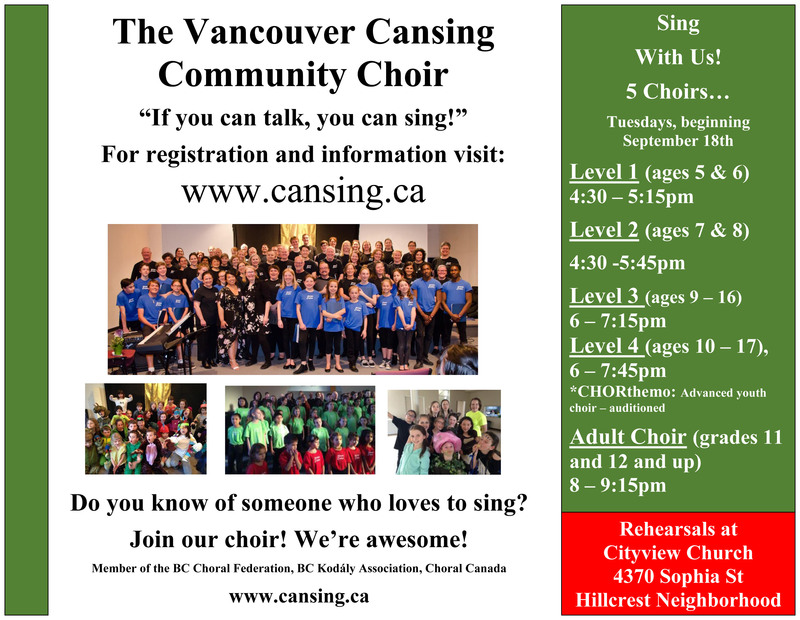 Choir rehearsals will begin Tuesday, September 22nd, Cityview Church (4370 Sophia St). Fees have gone up slightly to cover the cost of professional fees, larger rehearsal and performance facilities. The updated information can be found at the website. 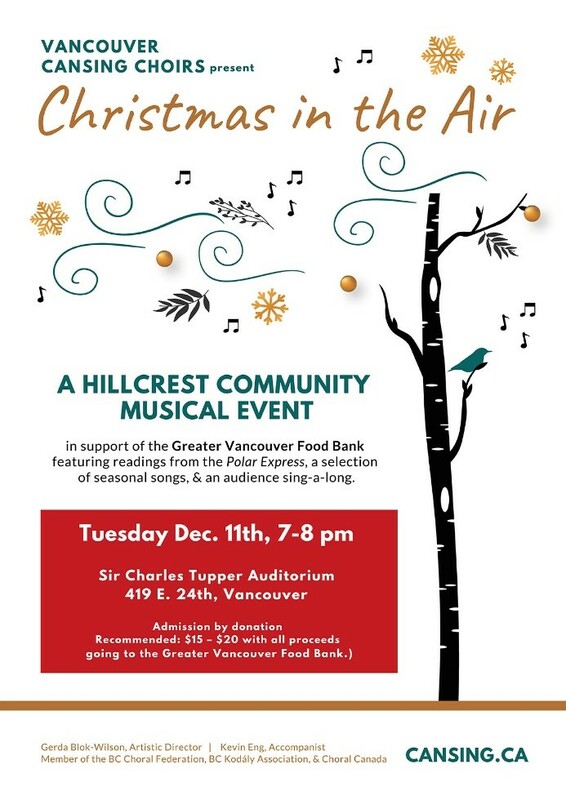 The VCS Adult choir Tuesday rehearsal time will remain the same. However, because of growth and strong skill level development in our Level 2/3 youth choir, a new auditioned VCS Level 4 (age 10 – 16) project choir has been added. Click below for information. This meant that the Tuesday rehearsal formations for Level 1, 2 & 3 needed to be revised to fit Level 4 choir and rehearsal time available. Early registration is encouraged. Last year, all choirs were closed before September rehearsal start up. Click the following for more information and registration. Here are the Vancouver CanSing Level 2 and 3 choir parts and Nutcracker choir music for the Goh Ballet: Nutcracker soprano part and Nutcracker alto part.